Complete Story mode twice, in the Hero and Infamous routes once. After the ending credits end, a message will appear which states that you have unlocked access to the opposite Karma powers of your current Cole, along with the powers of the character you did not transfer with. You will also receive 15,000 experience points. Use your XP to purchase powers while in a User Generated Level becuase, when you exit, you'll have your starting XP amount and all the powers you purchased. Note: This only seems to work on certain UGC missions. Equip your Alpha Bolt and keep shooting a body until it glows blue/red with electricity, then drain for an energy boost. Repeat this for unlimited energy. Use the Mission Editor to access Flood Town early by moving the marker to a bridge to Flood Town and raising it high above the bridge. Then, exit the Mission Editor and Cole will appear high in the air in the exact spot above the bridge. Using the height to your advantage, Thrust all the way past the raised bridge to Flood Town! Retain Infamous 2 saved game files after completing story modes as Bad (Infamous) Cole and Good (Heroic) Cole to unlock the ability to access (purchase) the powers and abilities that were "Karma Locked" during your initial two playthroughs. You'll also get 15,000 XP to spend on the new moves. This bonus is saved to the Infamous 2 master file on your PlayStation3 and cascades to all "cleared" games. Note: You must still buy the powers to be able to use them. Infamous 1 Completest Trophy - Finished Infamous with any karma standing on any difficulty, unlocks 1000xp bonus for Infamous 2. 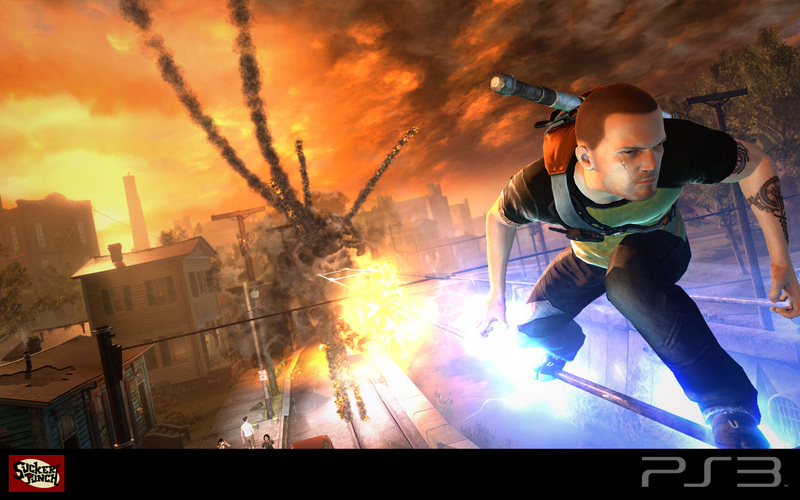 Specific Trophies indicate decisions made in Infamous reflect side missions, Dead Drops and even dialog variety in Infamous 2. In New Marais you can find a store called Red Ring electronics repair with a flashing red neon sign that resembles a dead Xbox 360 light. In one of the cinematics you approach Zeke reading a book. Notice the title to see he's reading 'Thievius Raccoonus', a reference to the Sucker Punch game Sly Cooper and the Thievius Raccoonus. Start a blank mission in the UGC Editor and move your marker to a location. Exit the editor without saving (press X) to have Cole appear in that location. Go to http://edgeshave.com/default.aspx#!/ps3Giveaway and register. Select the Gran Turismo 5 option and enter one of the following UPC codes. Successfully complete Story mode twice, in the Hero and Infamous routes once. After the playthrough's credits end, a message will appear. It states that you have unlocked access to the opposite Karma powers of your current Cole, along with the powers of the character you did not transfer with. You will also get 15,000 experience points. Behind the Curtain (Bronze): Collect 50% of the available Dead Drops. A Streetcar Named 'Boom!' (Bronze): Complete BOOM! Quid Pro Kuo (Bronze): Complete Leading the Charge. Playing Both Sides (Bronze): Complete Fooling the Rebels. Ambulance Chaser (Bronze): Complete Hearts and Minds Campaign. Am I The Daddy? (Bronze): Complete Nix's New Family. Exposure (Bronze): Complete Exposing Bertrand. The Cleaner (Bronze): Complete the assassination side missions. Frozen Asset (Bronze): Complete the ice Conduit side missions. Dazed and Defused (Bronze): Take down the Blast Shard Bomber. Back to the Bayou (Bronze): Return to the swamp blockade. Mountaineer (Bronze): Climb to the top of the 3 tallest buildings in New Marais. Extreme Makeover (Bronze): Destroy 30 verandas or other large objects. Watch That First Step (Bronze): Defeat an enemy by destroying the object they stand on. Finish What You Started (Bronze): Perform 100 finishers or ultra melee combos. Knockout in the Blackout (Bronze): Defeat 50 enemies in powered down areas while no missions are active. Go Long! (Bronze): Hurl 50 objects using the Kinetic Pulse ability. Cole' Blooded (Bronze): Defeat 100 civilians. Army Of Me (Bronze): Defeat 300 enemies. Hero to the People (Bronze): Stop 80 crimes in progress. Nothing Can Bring Me Down (Bronze): Stay off the ground for 130 meters. Return to Sender (Bronze): Send a Helicopter's rockets back at it using any Blast ability. Vehicular Manslaughter (Bronze): Defeat 25 enemies by throwing cars at them. Take Them For A Spin (Bronze): Hit at least 6 cars in a single Ionic Vortex. Shock and Awe (Bronze): Thunder drop into a group of 5 or more enemies. Thunder Flop (Bronze): Thunder drop from the highest place in New Marais. Head Hunter (Bronze): Use the Precision ability to rack up three head shots in rapid succession. Discerning Taste (Bronze): Take down a street performer who is imitating a statue. I'm As Shocked As You Are (Bronze): Defeat an enemy or civilian by stepping in water. Don't Fence Me In (Bronze): Climb a chain link fence and rejoice. Express Elevator (Bronze): Ascend 50 vertical launch poles. Heavy Hitter (Bronze): Use your Ionic Powers 30 times. Matching Set (Bronze): Unlock and purchase a power of each type by performing stunts. Level Up (Bronze): Create a new mission using the UGC level editor. UGC Curious (Bronze): Play 10 user-generated missions. UGC Veteran (Bronze): Play 25 user-generated missions. Trail Blazer (Bronze): Play 5 user-generated missions under the Newest filter. With Great Power Comes Greater Power (Silver): Unlock and purchase all powers. Shardcore (Silver): Pick up 50% of blast shards scattered around New Marais. Fight the Good Fight (Silver): Unlock the good ending. Forging Your Own Path (Silver): Unlock the evil ending. Land Lord (Silver): Take over the first island in New Marais. It's My Town, Now (Silver): Take over the second island in New Marais. Well inFORMED (Silver): Collect all Dead drops. Arch Villain (Silver): Earn full negative Karma. Incorruptible (Silver): Earn full positive Karma. Pain Builds Character (Gold): Finish the game on hard difficulty. Just One More (Gold): Pick up all the blast shards scattered around New Marais. Additionally there are three secret trophies. Closed Casket Affair (Bronze): Give Bertrand what he wants. Status Kuo (Bronze): Choose Kuo in Storm the Fort. Get Nix'ed (Bronze): Choose Nix in Storm the Fort.